Colling System or cooling system is divided into two, including water cooling system and air conditioning system. Both function to cool or maintain the entire engine / engine temperature. passing through the thermostat and then into the upper tank and continuously circulating. Now that's the tutorial about the Cooling System (Cooling System). Hopefully this tutorial can be useful for us all. Don't forget to visit Eri Automotive to get other automotive science. If there are words that don't understand or there is little input from you, just comment on the comments below. 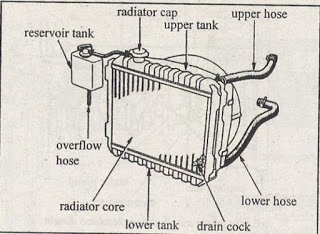 0 Response to "Understanding of the Cooling System (cooling system on the vehicle)"